Undeniably the images etched in our minds from the destruction and chaos of Katrina will forever weigh on our hearts. 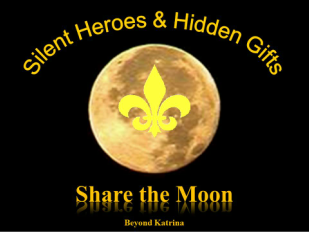 However, despite the tears and the sleepless nights that have followed, it would be equally tragic to ignore the profound acts of generosity, compassion, and sacrifice, no matter how large or small, that flooded the streets of New Orleans in the immediate aftermath of Katrina, and continue to saturate the city today. 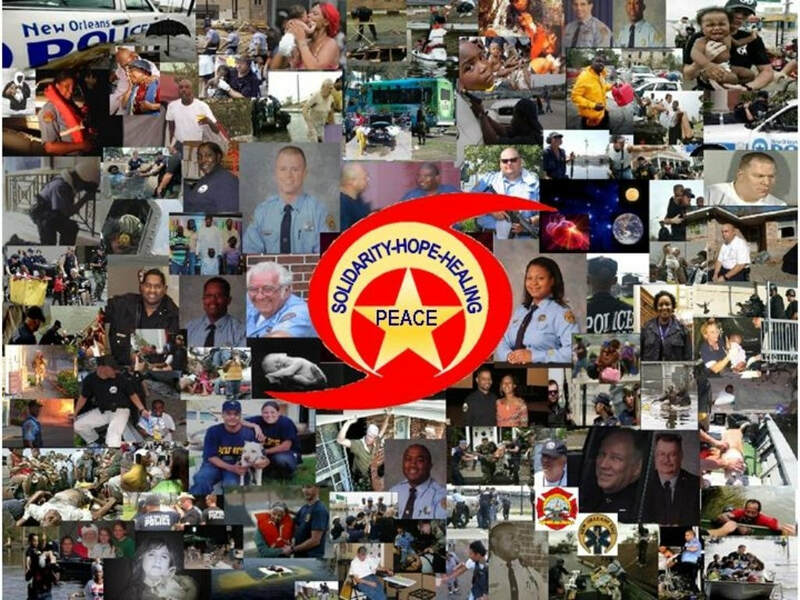 Here in New Orleans, after Katrina, First Responders joined forces with civilian volunteers to rescue as well as meet the needs of tens of thousands of people. From grandmothers to commissioned police officers, people selflessly put the needs of others first. Grandmother Gwendolyn Martin Washington, seeking refuge with the rest of her family in an attic to escape the rising water, fell through the ceiling sustaining painful injuries to her rib area. In agonizing pain, once transported to dry land, she was laid onto I-10 until further aid could come. Using the curb as a pillow, no shade and temperatures near 100, Ms. Washington, without hesitation, offered an umbrella given to her for shade to her two small grand children. Ms. Washington is pictured at left as captured by Photographer Rick Wilking of Reuters, shortly after being rescued. for his life in the days immediately following Katrina. It just so happened Officer Thomas was a newlywed at the time. Three months prior to Katrina he married his wife Thelma. Lovingly, his new bride Thelma, anxiously kept a bedside vigil at West Jefferson Hospital uncertain what the fate of her new spouse would be. Officer Thomas eventually awoke, with Thelma at his side. Though he is still recovering from his injuries and is unable to return to work, he maintains a spirit of gratitude for life and family. 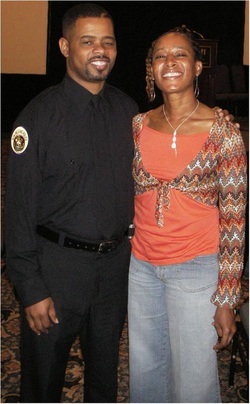 Officer Thomas and Thelma are pictured at right. 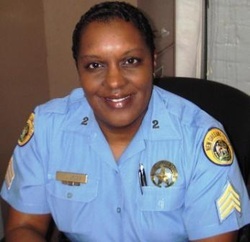 Personally, one of my favorite stories is that of NOPD Sergeant Troy Lyles. Sgt. Lyles was rescued by a civilian who used a door to float her out of her flooded home. She reported to duty at Little Sisters of the Poor Nursing Home. These accommodations were secured by Lt. JJ Jackson upon his own initiative and foresight after learning it had been wisely secured by NOFD previous to the storm. Upon her arrival, at an impromptu prayer service, though her home was flooded and she was uncertain of the where about of her family, Sgt. Lyles faithfully belts out a song from her heart. To this day I still get goose bumps when I hear it! Unfortunately, it also still saddens me to know, such stories are overshadowed by all the negative publicity surrounding the NOPD and the people of New Orleans during the aftermath of Hurricane Katrina!!! You can listen to Sgt Lyles perform at below.